Tackling teen acne begins with an effective skincare routine, and it doesn’t have to be complicated. For most, it only takes four products: a cleanser, a leave-on exfoliant that contains salicylic acid (BHA), a benzoyl peroxide product, and, for daytime, a super-light broad-spectrum sunscreen. Paula’s Choice Skincare has acne figured out—we’ve been there, and we don’t want others to have to suffer with breakouts. We approach acne differently from other skincare lines because we use research-proven, gold-standard ingredients that target the sources of acne, fast. Here’s how the morning and evening skincare routines would look—once you get the hang of it, you’ll be surprised at how fast it goes—clear skin will be its own reward. Cleanse with a soap-free, water-soluble formula designed to be gentle (because not being gentle to skin can increase acne breakouts), but cleanse thoroughly. Paula’s Choice Skincare CLEAR Normalizing Cleanser is ideal. Use a soft washcloth or soft-bristle cleansing brush to make sure you remove excess oil. Exfoliate to help unclog pores with a leave-on, gentle, salicylic acid product designed for acne-prone skin. Paula’s Choice Skincare CLEAR Anti-Redness Exfoliating Solution is perfect; you’ll be amazed at the difference a product like this makes—much better for acne than a face scrub! Choose our Regular Strength version for mild to moderate breakouts; use Extra Strength for more stubborn acne. Apply a benzoyl peroxide product to all breakout-prone areas. Benzoyl peroxide is the gold standard acne-fighting ingredient because it immediately targets the source of acne breakouts. Paula’s Choice Skincare CLEAR Daily Skin-Clearing Treatment comes in two strengths: 2.5% or 5% benzoyl peroxide. Begin with the lower strength and see how your skin responds before moving to the higher strength option. The evening routine is the same as the morning routine, minus the sunscreen. If your skin is dry or you notice some mild flaking, apply a thin layer of a light, gel-type moisturizer over those areas. Paula’s Choice Skincare SKIN BALANCING Invisible Finish Moisture Gel hydrates and smooths skin texture without feeling the least bit slick or greasy. You can dab it around the eyes, too! Not washing the face gently twice daily. 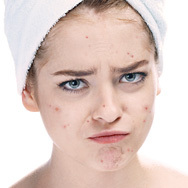 Dirty skin does not cause acne, but not washing your face enough can lead to a buildup of oil and dead skin. This combo creates the perfect environment for acne and clogged pores. Not being gentle. Overdoing cleansing with abrasive scrubs, stiff-bristle cleansing brushes, or products with skin-aggravating ingredients (such as SD or denatured alcohol, witch hazel, menthol, peppermint, essential oils, and citrus oils) damage skin’s surface. If it hurts or tingles, that means it’s bad for skin! Putting your skin in this weakened state means more pimples and oil production can occur, and post-acne marks will probably stay around longer too. Not removing your makeup at night. Many teens cover up acne with makeup, but if you don’t remove all of your makeup every night, your acne treatments won’t work, and your clogged pores will only get worse. Inconsistent skincare: The only way to clearer skin is to follow a consistent, effective skincare routine. Consistency and patience are essential. Hairstyling products: Any creamy, waxy, or oily leave-on products applied to hair that falls on your face can cause breakouts in those areas. The solution: Keep hair off your face and use lighter hair-styling products!